The picture's caption caught my eye, "Norwell Public Library has an old card catalog cabinet that is used to hold seed packets for a seed-lending program." I wondered if I would read about one of my favorite former (i.e. before I retired) colleagues, Rebecca Freer, the Library Director in Norwell. In addition to "Becky" I also read quotes from others I had worked with on library network and committee meetings, including Carol Jankowski,Charlotte Canelli, Elizabeth Marcus, who I knew as Betsy Wolfe when she was Director at the Thayer Public Library in Braintree, before she replaced me as Director of the Brockton Public Library when I moved on to the Thomas Crane Library in Quincy. It's fun to see how creative librarians can be in repurposing all that beautiful wood, and amazing to see the prices these "library discards" now command. They are nearly extinct in their natural habitat. In the James Library & Center for the Arts in Norwell, one maintains its position at the end of a large bookcase near the center of the room, its counterpart sentry for an antique grandfather clock. In the Dyer Memorial Library in Abington, it has been relegated to the corner, left mostly untouched for the past decade. They are the wooden card catalog cabinets, once an essential component of town and school libraries. Now they are mostly relics of the past, repurposed in some cases to hold recipes, display Christmas cards, or stash canned goods. She said the independent library does not loan out its books as part of a larger network and its collection of roughly 8,000 books is small enough that the card catalog is still functional. The labels on the drawer fronts begin with A-AQ, and the cards within describe the content and locations of the books, both old and new. Likewise, in nearby Pembroke, the all-volunteer Lydia Drake Library, once a former schoolteacher’s home, uses three similar catalog cabinets, said Joanne Tavares. “A lot of us volunteers are retired people and we tend to be senior-type people, so I don’t think it’s out of the way for us to be doing this at all,’’ she said of using the printed cards to find books. She said it is a backup to the computerized records at the library, which focuses on the local histories of Abington, Rockland, and Whitman. Duxbury Free Library director Carol Jankowski said she cannot recall seeing any catalog cabinets when she arrived there in 1997. “It’s ancient history,” she said, jokingly. But, she said, she does have a small four-drawer card catalog cabinet in her home that she bought for $5 at a yard sale. She said that is where she has put her Christmas cards. She said she has two such cabinets in her home, which she uses to hold canned goods. She said she guesses she has had them for 30 to 40 years. She said she thinks her mother might have bought them at an auction in the 1970s. Catalog cabinets could be found recently selling on eBay for $159.19 for a vintage four-drawer office desk-top model in the United Kingdom to $850 for a 72-drawer index card file cabinet in Cleveland, local pickup only. Gaylord Brothers, which made half of the James Library cabinet (which is actually two smaller cabinets stacked), still makes card catalog cabinets. A new compact four-tray cabinet sells for $785 and can be ordered in cherry, oak, or mahogany. A 10-tray sells for more than $1,800. Coleen Gagliardo, vice president of sales and marketing for Gaylord Brothers, said sales have been dwindling, but added there are still some government institutions, museums, and others that rely on them. And there are those who purchase them for other uses. “It’s become a piece of nostalgia, and they found their way out of libraries and into breweries, restaurants, and even in individuals’ homes,” she said. Alternate uses for card catalogs can be found on various online sites. Mentalfloss.com points out that a “geek chic catalog” can be found on “The Big Bang Theory” television series and suggests 10 fun uses for the cabinets, including storing sewing supplies, warehousing wines, and serving as a coffee table. Elizabeth Marcus, president of the Massachusetts Library Association and director at the Brockton Public Library, recently asked other library directors via e-mail about the whereabouts of their catalog cabinets. She said at least one responded that she regretted their library had not kept at least one. “Everyone covets these things — they are good furniture,’’ Marcus said. One middle school librarian in Dedham recalled with fondness the scene in “Breakfast at Tiffany’s” in which Audrey Hepburn and George Peppard stand in front of a card catalog cabinet in a branch of the New York Public Library. Charlotte Canelli, director of the Morrill Memorial Library in Norwood, said some libraries keep what they can of the older furniture, but the card catalog cabinets are bulky and often there just is not room. Rebecca Freer, director of the Norwell Public Library, said the card catalog there was seen as a big piece of furniture taking up space, so it was removed a couple years ago. 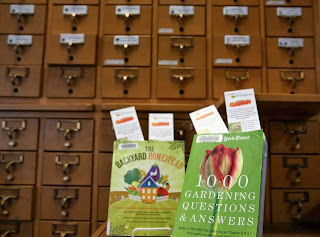 That decision was regretted soon after, however, when library staff were looking for a place to store flower, herb, and vegetable seeds for a seed-lending program. So she said a trustee found an old card catalog and bought it for the library. She said the drawers are just the right size to store the seed packets. E-mail Jean Lang at jeanmcmillanlang@gmail.com.